On my last visit to my father’s house in France, he handed me an old biscuit tin, smiled and said “try this!” Given the age of the tin, I assumed there was something else in there — not aging biscuits. Inside was a golden, nut-filled granola. It was his creation. I was very impressed and had the best intentions to make my own when I returned to California. More than a year later, whilst visiting friends Harley and Ute in the Bay Area, I once again sampled some excellent homemade granola. It dawned on me that I had procrastinated too long. It was time to make my own! This combines my father’s recipe and my friends’ recipe with my penchant for dried fruit and lots of almonds. This is one of my favorite breakfasts, however, I’ve been known to have it for lunch too! Combine the oats, almonds, flax seed and brown sugar in a large bowl. Mix the oil and honey in a small bowl. Pour it over the oat mixture and stir well to combine. Spread the oat mixture in an even layer onto a rimmed baking sheet. Bake in the center of the oven for 30 minutes. Add the hazelnuts and pecans to the oat mixture, stir to combine and spread in an even layer once more. Continue to bake for 20 minutes. The oats and nuts should be golden brown. 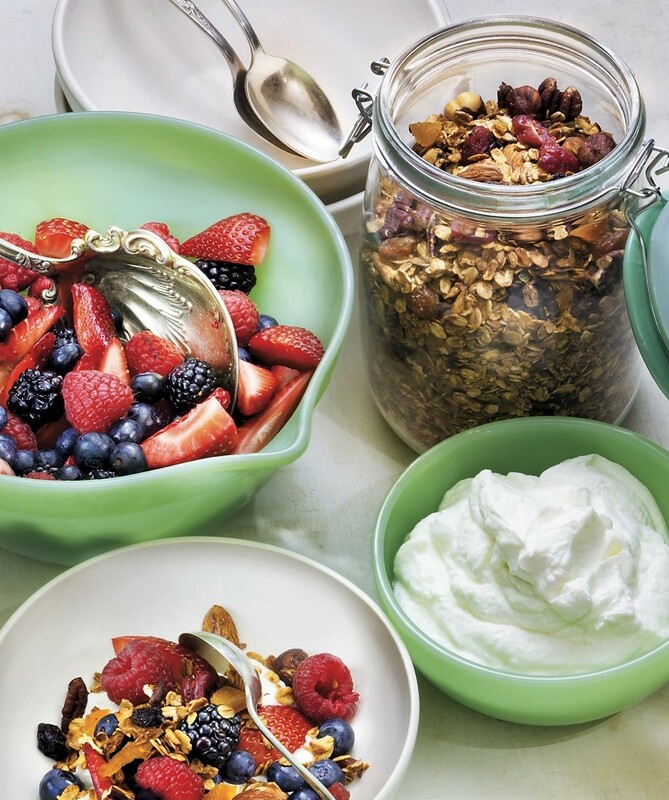 Let the granola cool completely before adding the chopped fruit. Mix well and store in an airtight container. For this recipe click on the image below.